Rules: A bank of shapes is given with the grid, usually with each shape labeled for your convenience. Place each of the shapes exactly once into the grid, with rotations and reflections allowed. No two shapes can overlap or be orthogonally adjacent, and all of the space not occupied by shapes must be connected. Black circles in the grid represent spaces that must be contained in one of the shapes, and white circles represent spaces that may not be contained in a shape. Answer String: Enter the length in cells of each of the shape segments from left to right for the marked rows, starting at the top. Separate each row’s entry with a comma. This example has the key “1121,1133,21,121”. (Brief) History of Statue Park: The type as presented here is due to Palmer Mebane, who first posted it on his old blog in September 2011. It was directly inspired by the pentomino puzzles from Akil Oyunlari’s Meraklisina (puzzles for fans) volume 1, which showed that it was possible to make good pentomino puzzles with clean logical steps instead of requiring intuition. 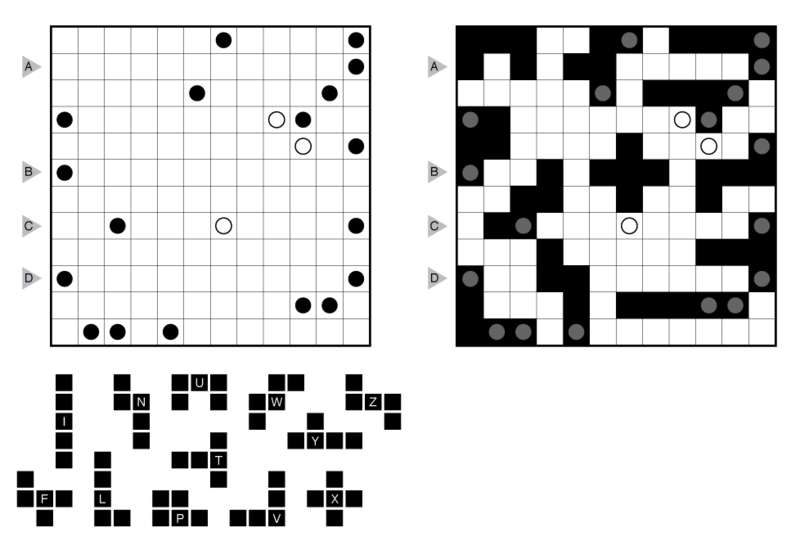 To this basic object placement puzzle type, Palmer added in the black square/connectivity rules from Nikoli types like Heyawake and Hitori, and the new style “Statue Park” was born. History of this example: This puzzle was II.29 of Palmer’s Statue Park pack. It is the first and arguably easiest of the puzzles in the Full Pentomino section, with a very limited solving path that proceeds clockwise. Sources for Statue Park Puzzles: Follow this link for Statue Park puzzles on this website. If you are new to this puzzle type, here are our easiest Statue Park Puzzles to get started on. More Statue Park puzzles can be found in the ebook Statue Park by Murat Can Tonta. Design rules for contributors: A Grandmaster Statue Park will have a unique solution that can be reached by logic alone. Generally, a Grandmaster Statue Park will have an interesting visual theme or an interesting solution. Usually one of the “standard” puzzle shape sets such as the tetrominoes or pentominoes will be used, but custom shape sets are possible as well.